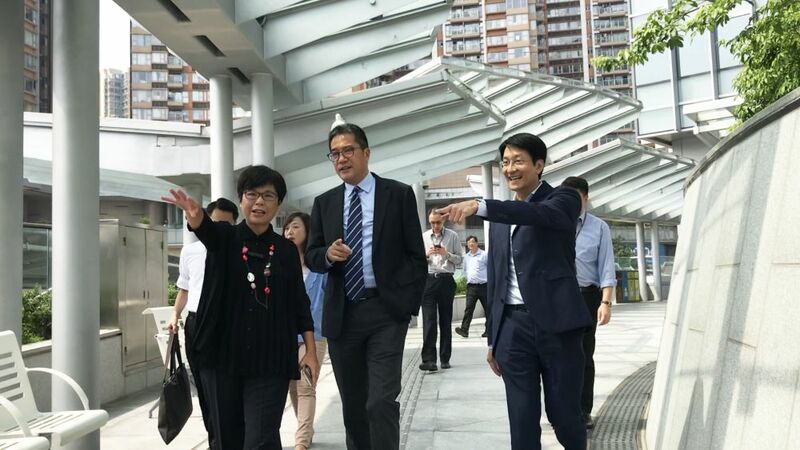 ﻿ ﻿ Project Director of the Architectural Services Department (ArchSD), Mr WONG Tak-choi, Frank (right), briefs the SDEV, Mr Michael WONG (centre), on the layout of the walkways outside the TI Tower. The planning and design of the TI Tower aim to provide an array of walkways and footbridges that run through different locations to enhance connectivity. Project Director of the Architectural Services Department (ArchSD), Mr WONG Tak-choi, Frank (right), briefs the SDEV, Mr Michael WONG (centre), on the layout of the walkways outside the TI Tower. The planning and design of the TI Tower aim to provide an array of walkways and footbridges that run through different locations to enhance connectivity.